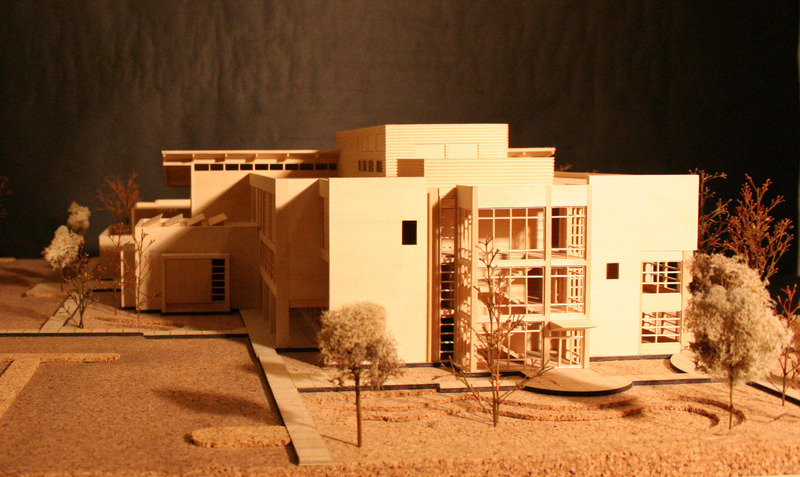 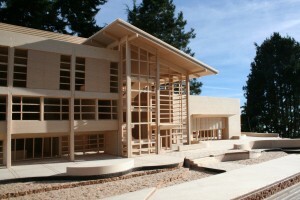 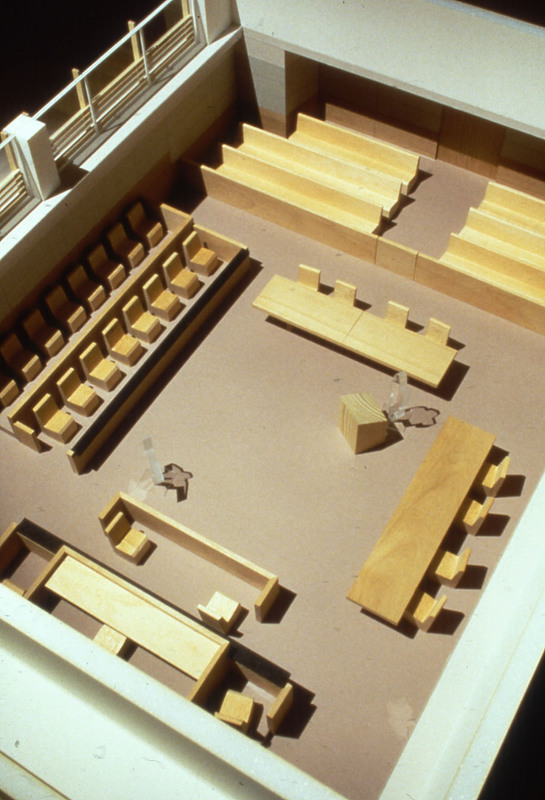 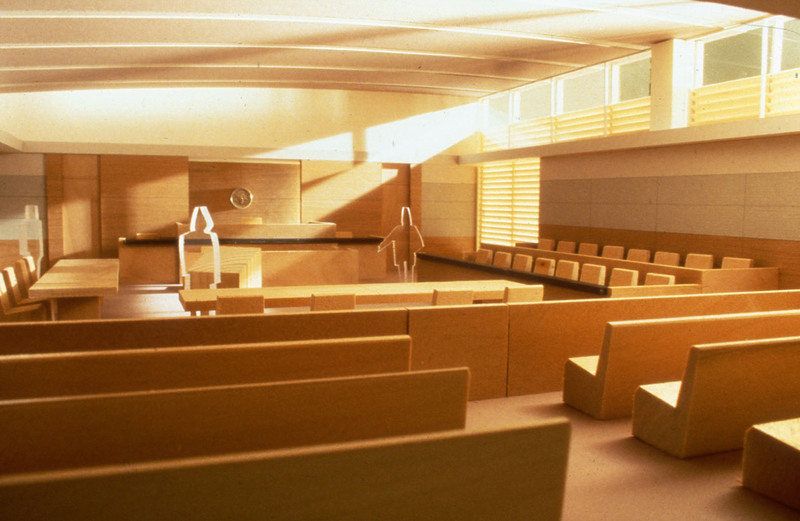 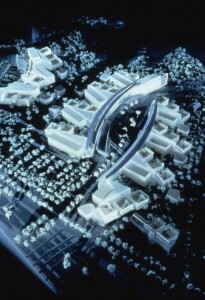 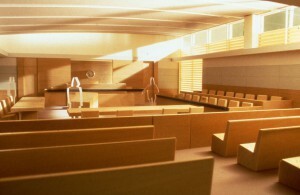 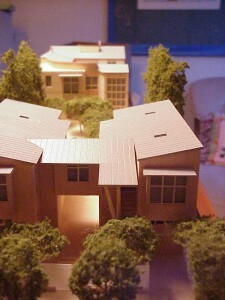 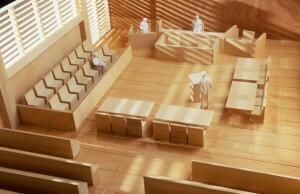 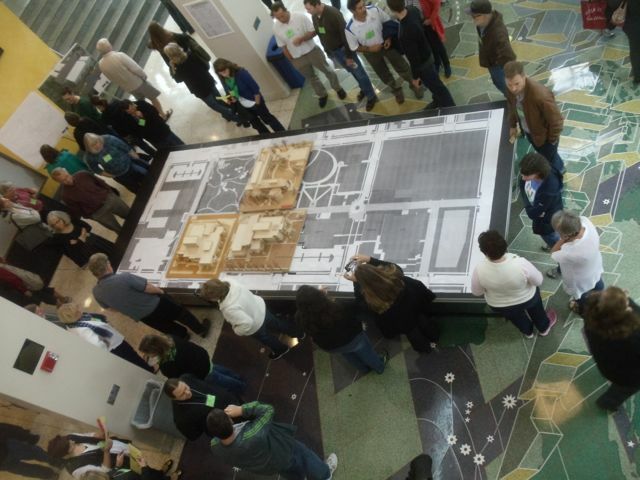 An open basswood model of one of the Schools at Centralia College. 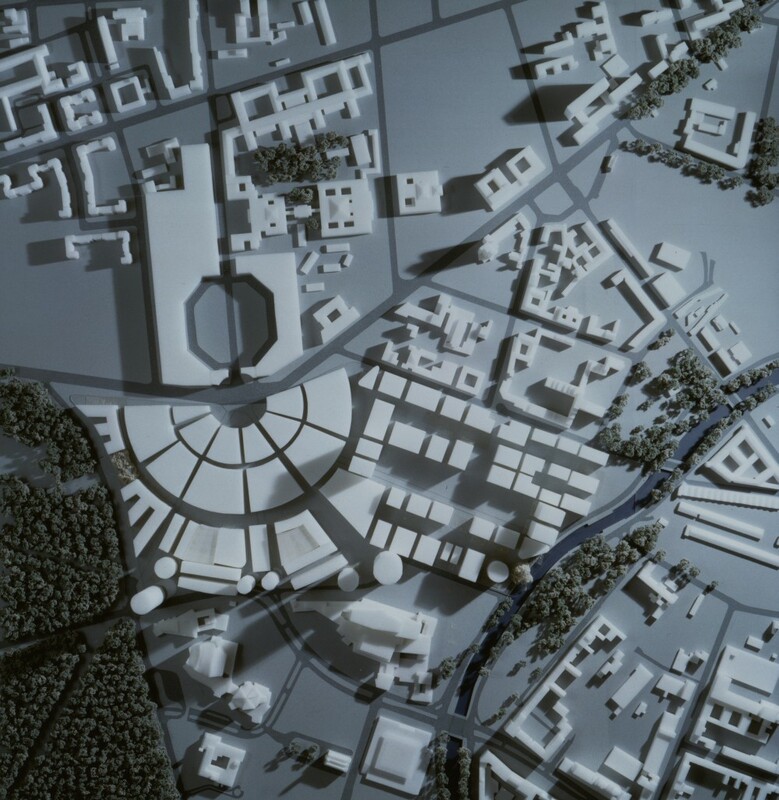 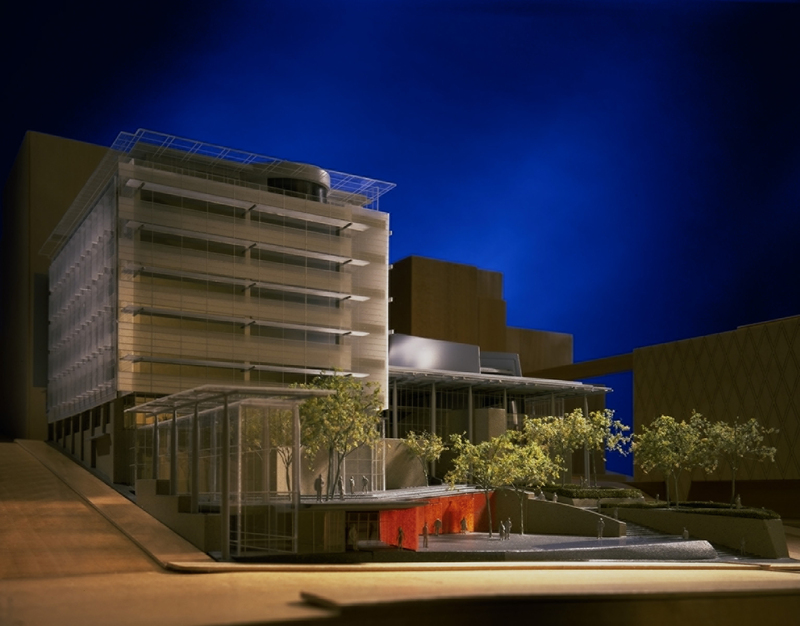 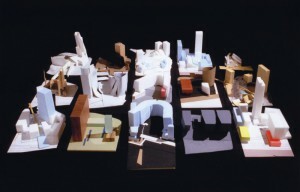 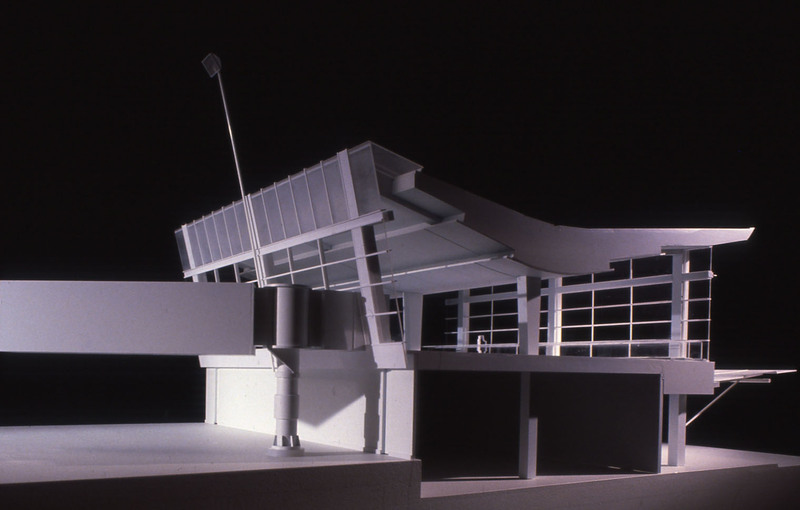 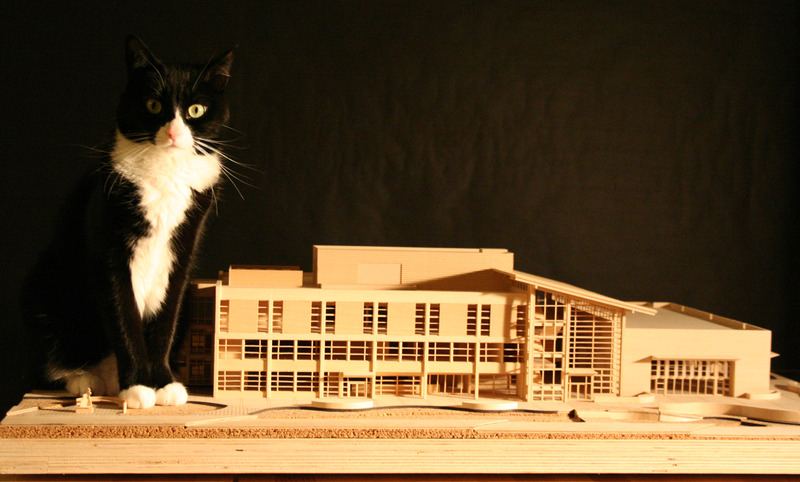 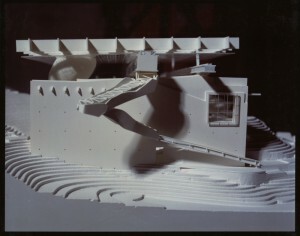 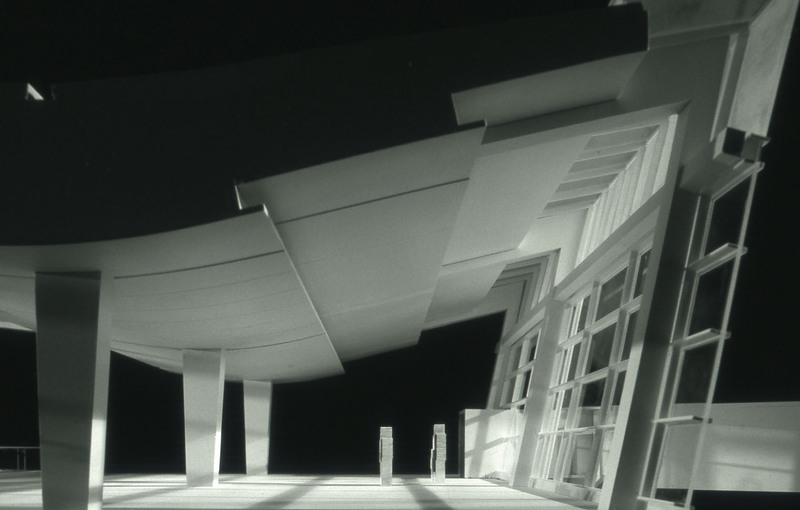 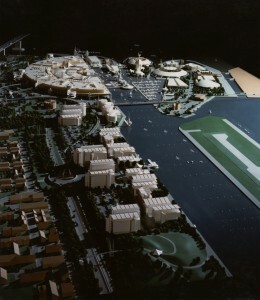 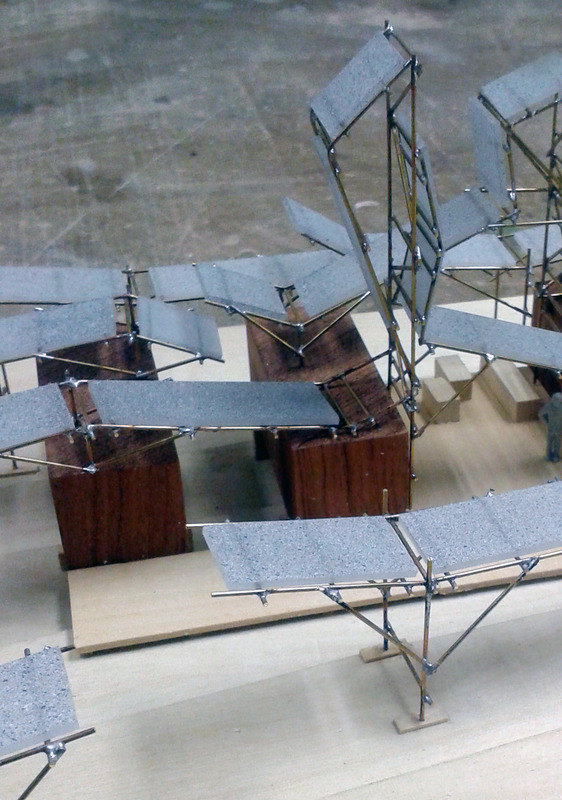 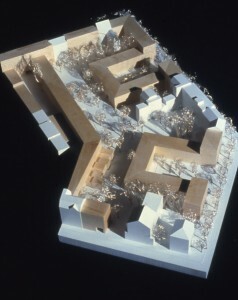 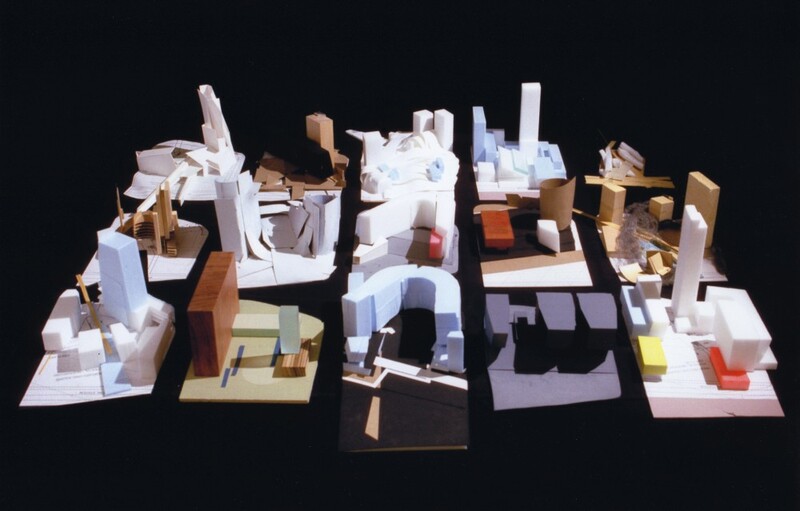 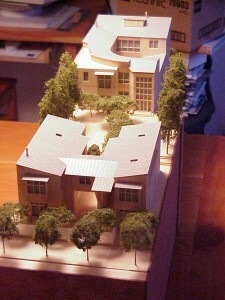 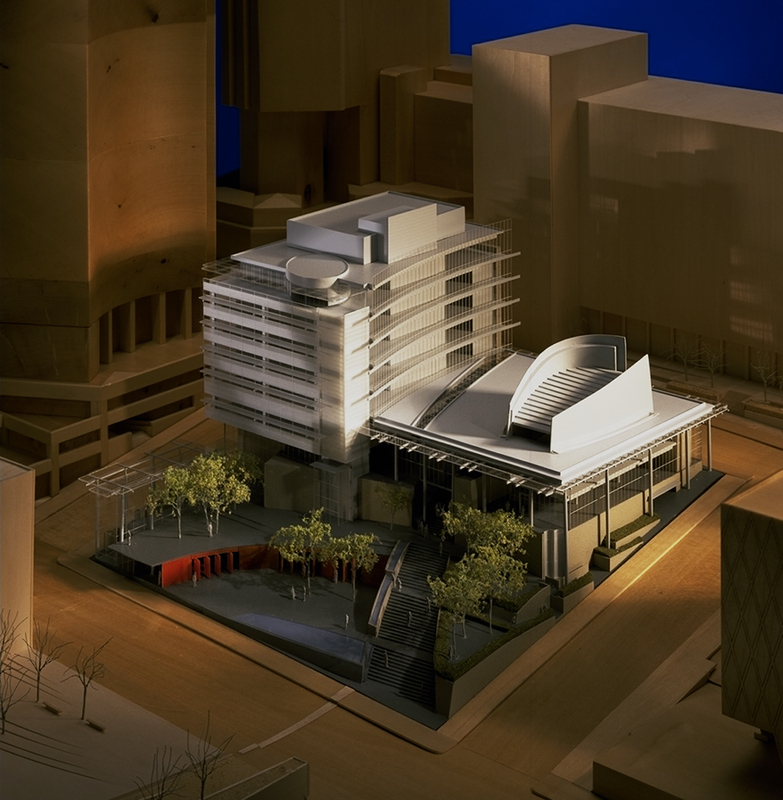 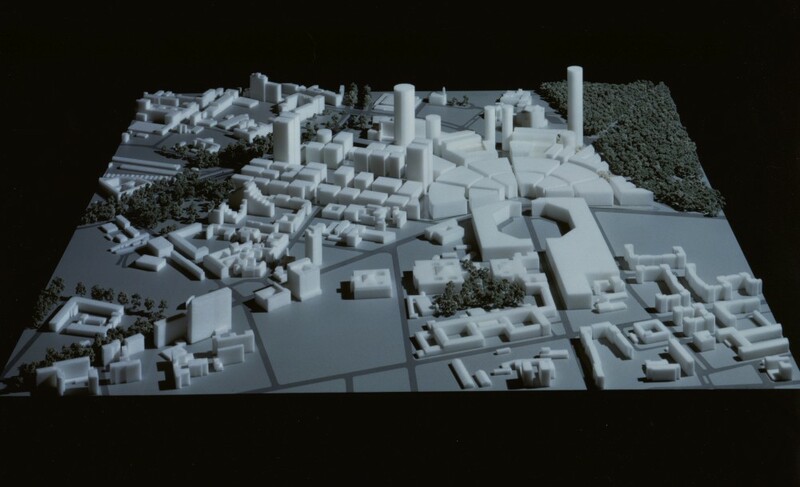 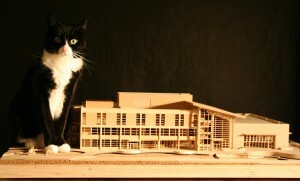 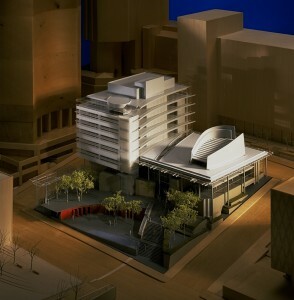 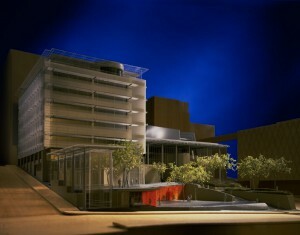 This model was designed to fit in with a series of campus schemes. 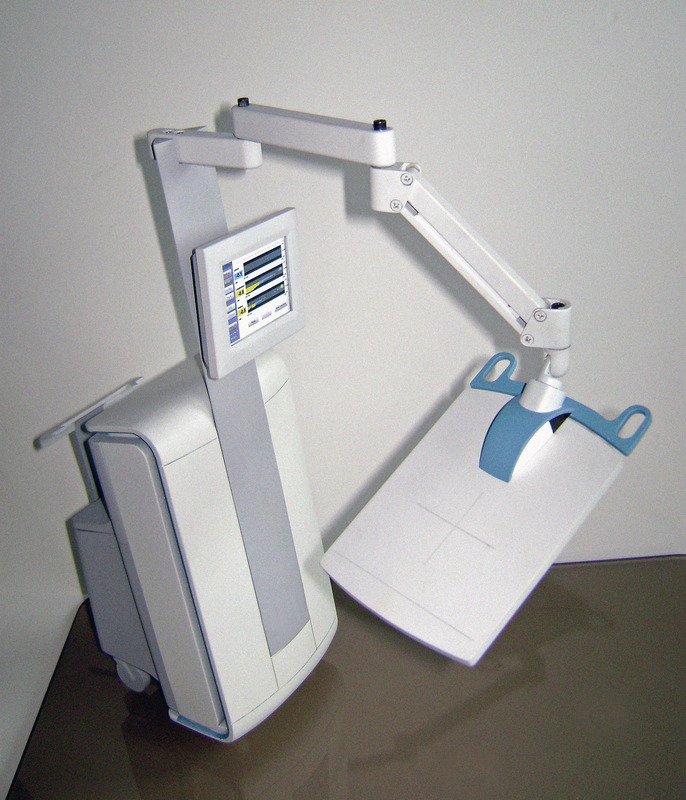 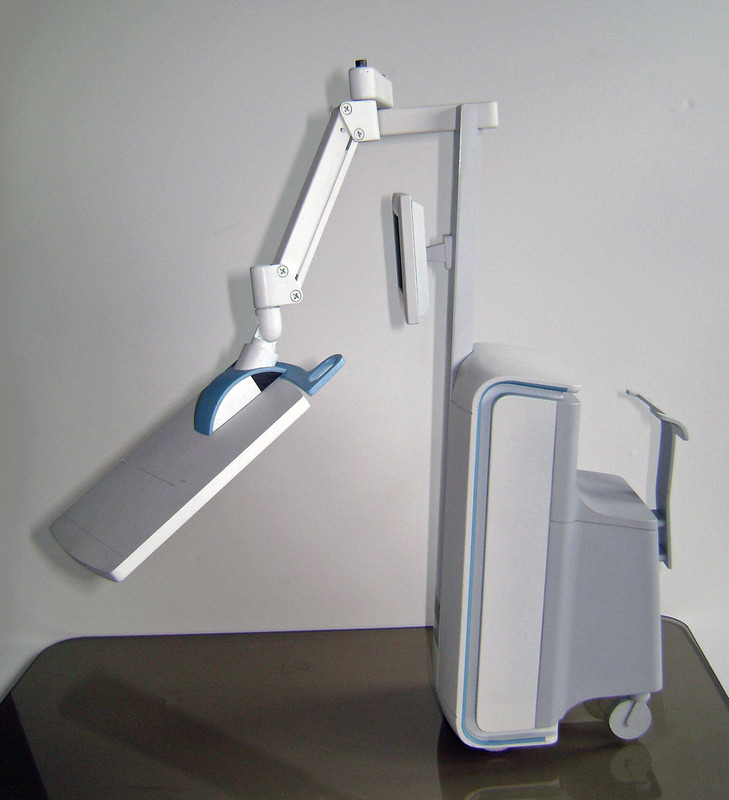 A scaled down model of a Medical Scanner designed as a travelling sales tool. 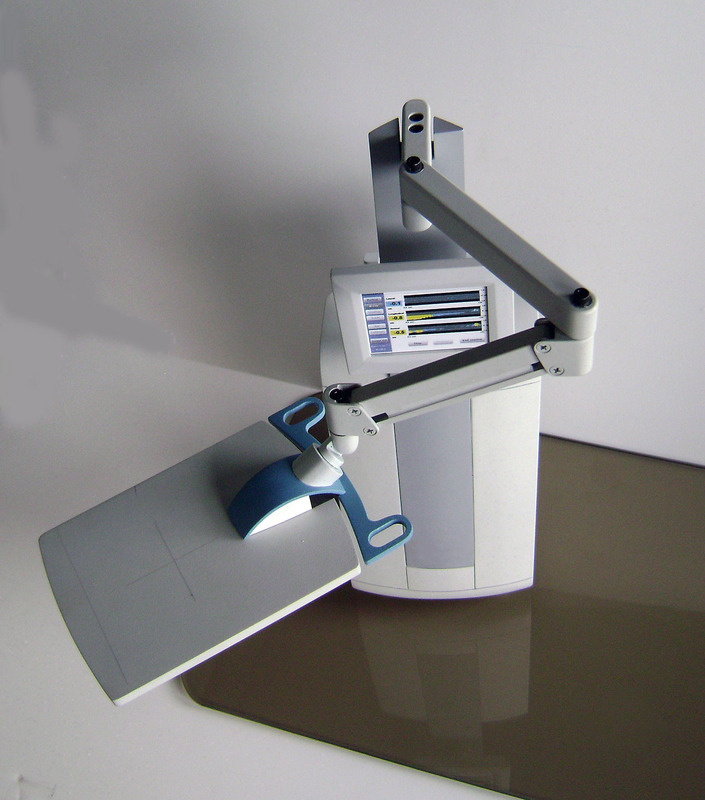 It features a fully articulated arm that bends in five different axes to demonstrate how it deploys and retracts throughout its full range of motion. 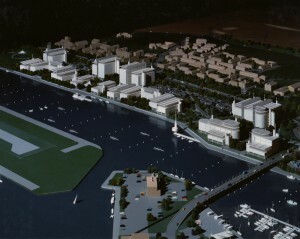 A competition with a heavy bias on sustainability issues, the design reached the third stage of final 20 schemes. This scheme had at its core the reuse of shipping containers as house enclosure as well as water storage and transportation enclosure. 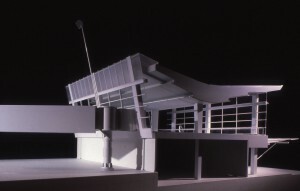 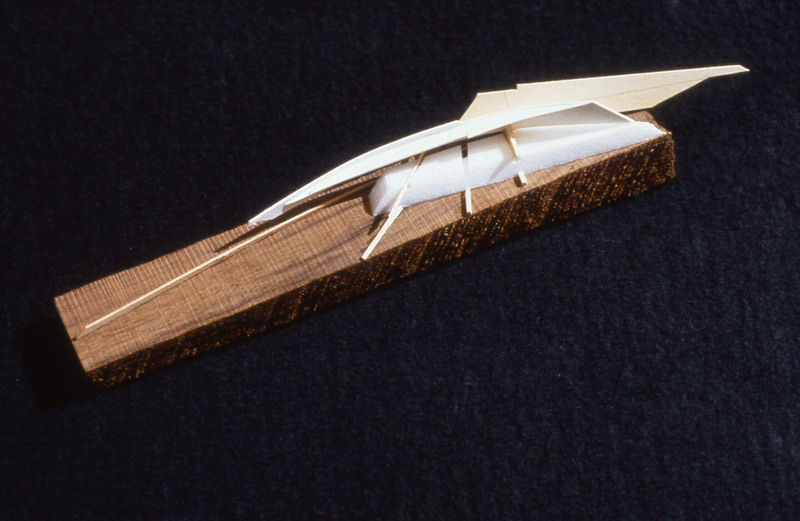 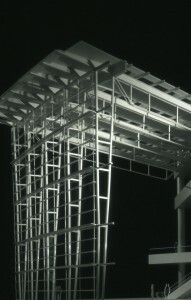 Design working model for winning competition entry. 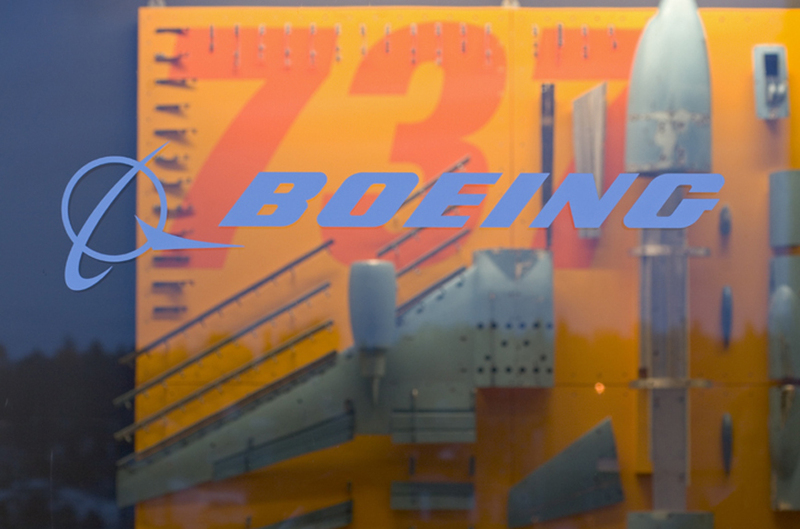 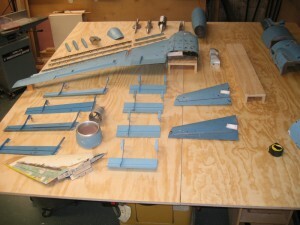 An installation using original wind-tunnel model pieces of a Boeing 737 from the early 1960’s including different landing flap configurations, tail pieces etc. The installation hangs in the entrance lobby of the 737 program at the Renton Boeing plant giving clients the full perspective of initial design through completion. 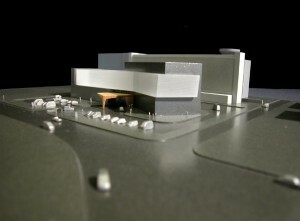 Quarter full-size model of company logo with lighting and super realistic painted finish of final materials. 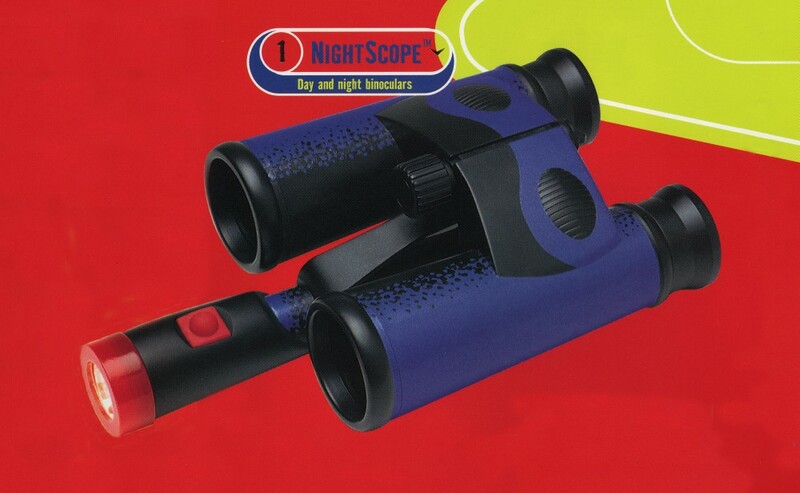 Working Model of illuminated binoculars for kids’ adventure/explorer toys by Wild Planet in San Fransisco. 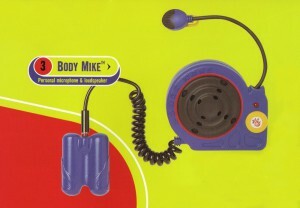 Working Model of a personal microphone and loudspeaker for kids’ adventure/explorer toys by Wild Planet in San Fransisco. 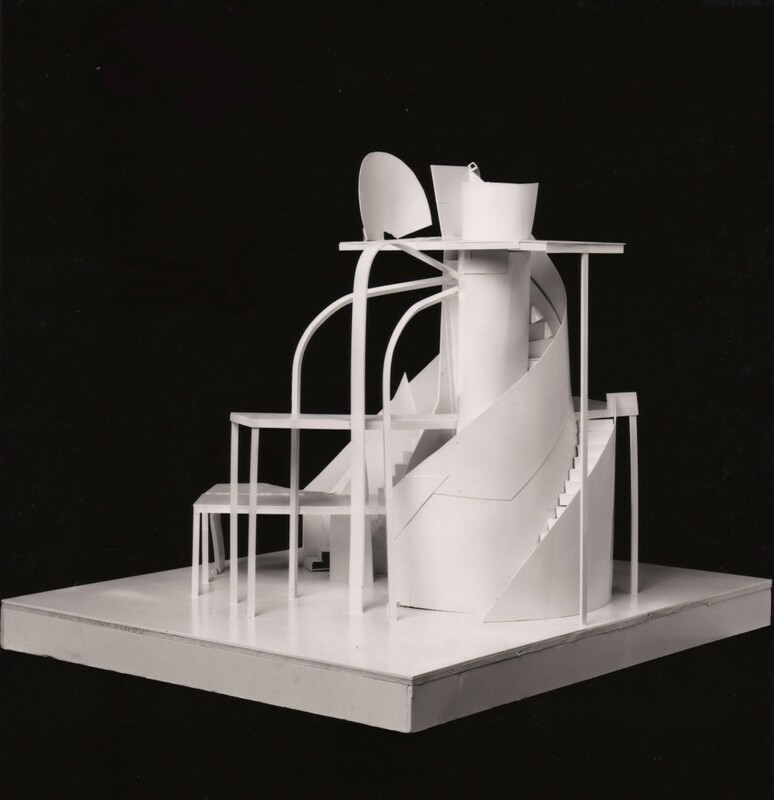 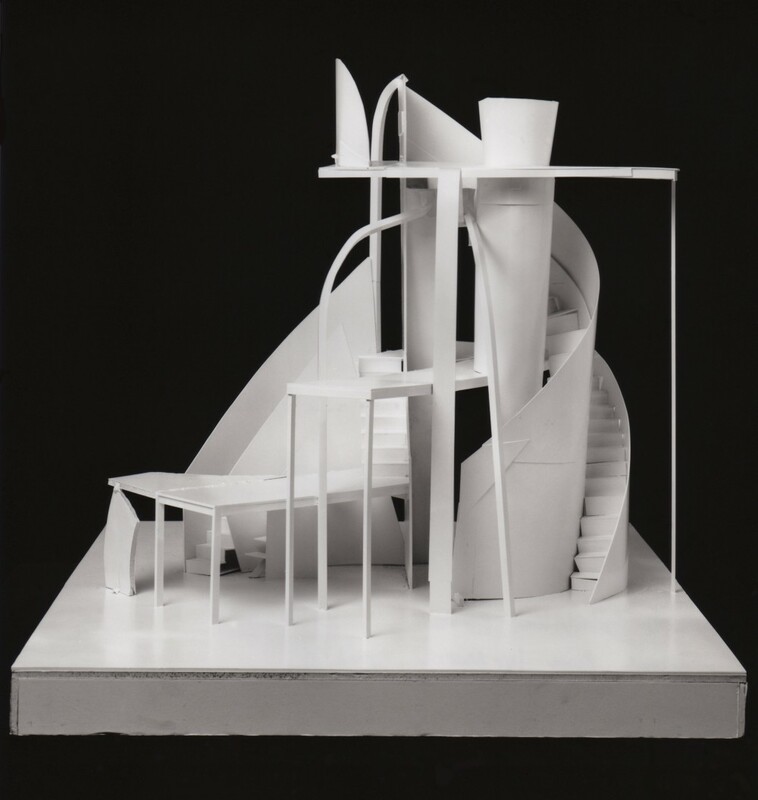 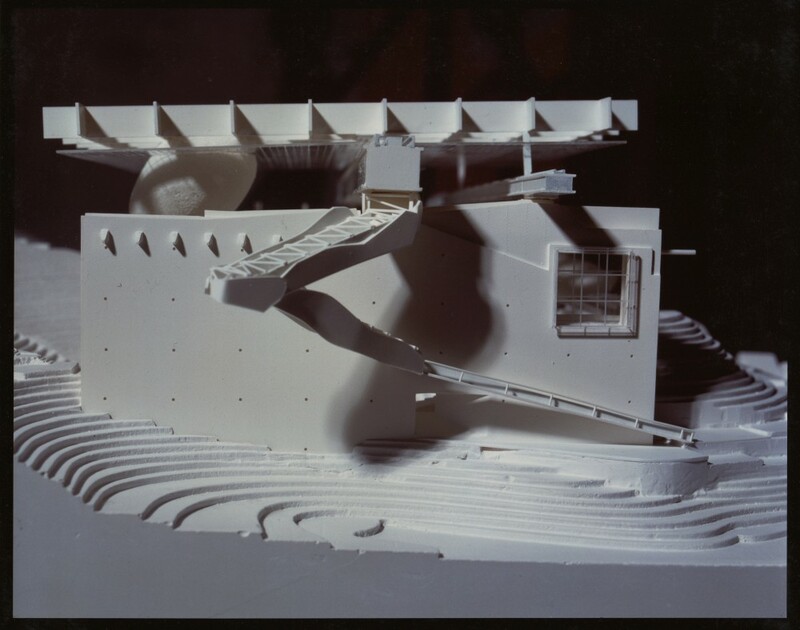 Caro was interested in finding a new way to work where small scale plastic/paper models were built which led to 1/3 scale steel models which eventually became the full size piece. 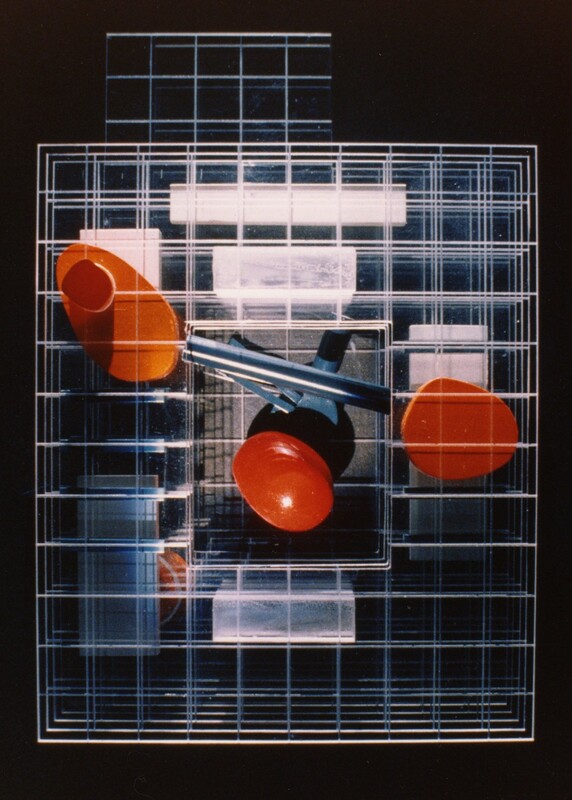 This new method marked quite a shift in Caro’s ability to think faster and more interactively; with his ideas flowing quickly and myself building them in front of him, they would progress and grow exponentially. 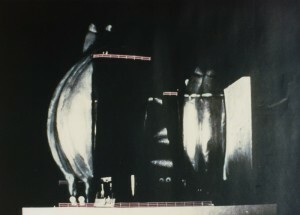 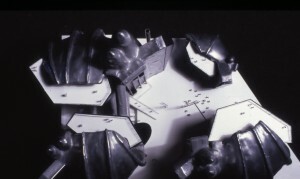 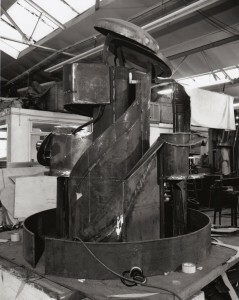 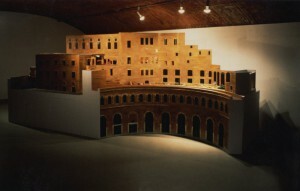 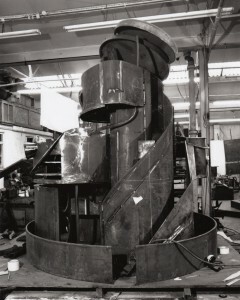 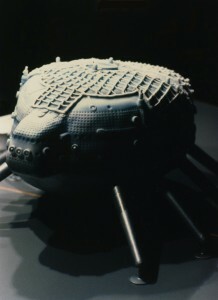 The full size “Rotonda” was exhibited at the Tate Gallery. 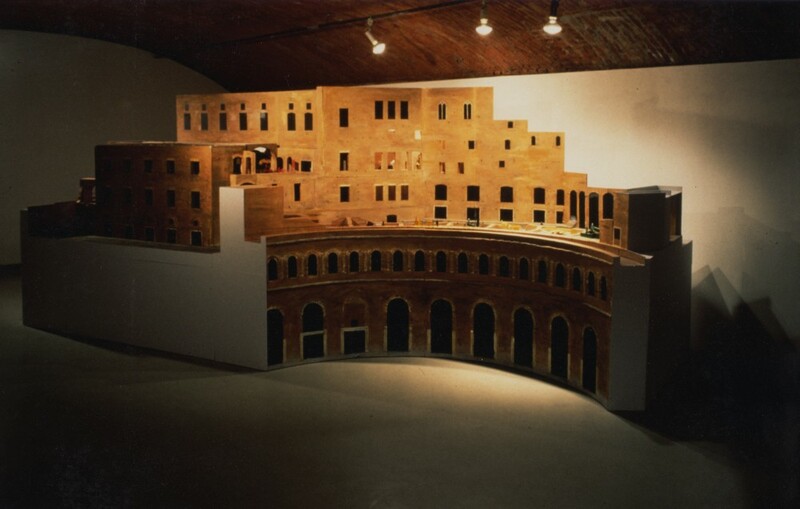 The Trajan Market in Rome formed the backdrop for the 70 year retrospective of Caro’s fantastic sculptures. The model was about 25’ long x 9’ tall and came apart so Caro could climb in and move the small models of his steel sculptures around to get them in the best location. This worked out very well as it was considerably easier to move small plastic models than a 6 to 10 ton steel sculpture. 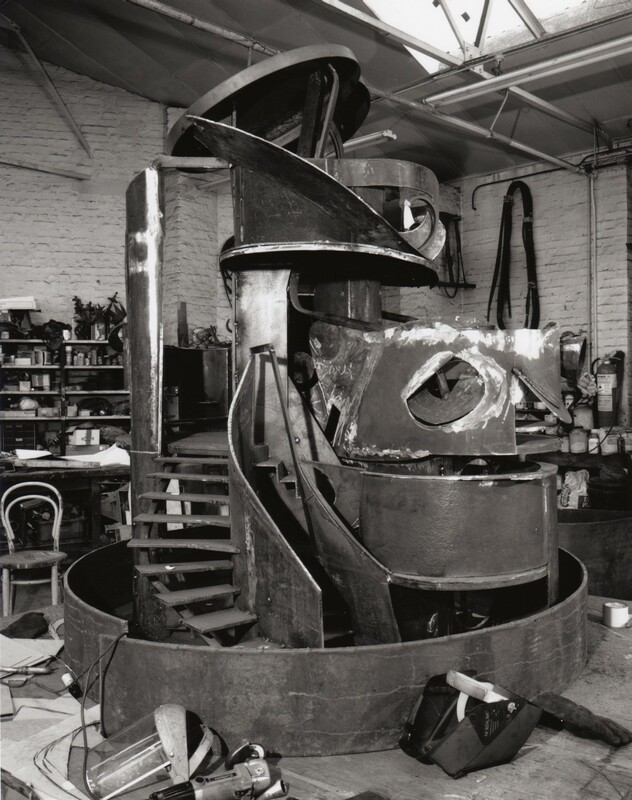 Caro was also able to quickly visualize which sculptures worked well with others and how the whole would thing would work in this most incredible location. 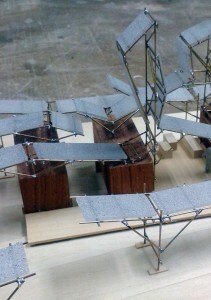 Interestingly enough the model was also exhibited on site and garnered a lot of positive interest. 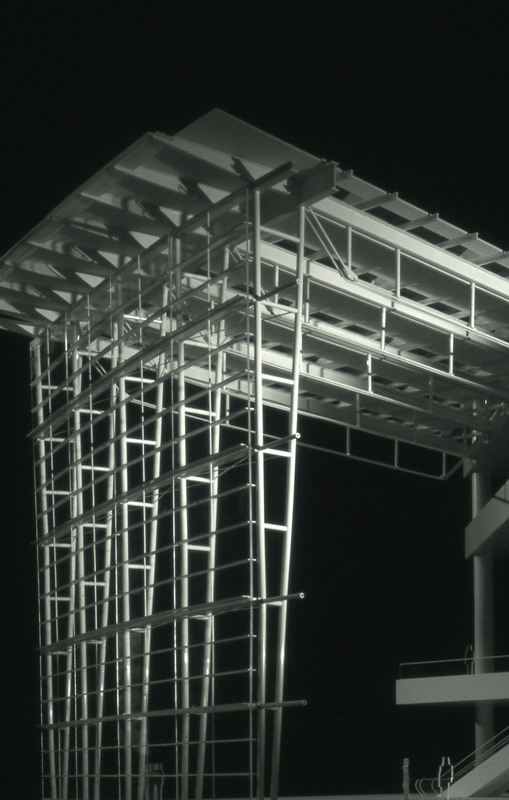 A competition for a combination winter ski jump and summer Expo setting in Austria. 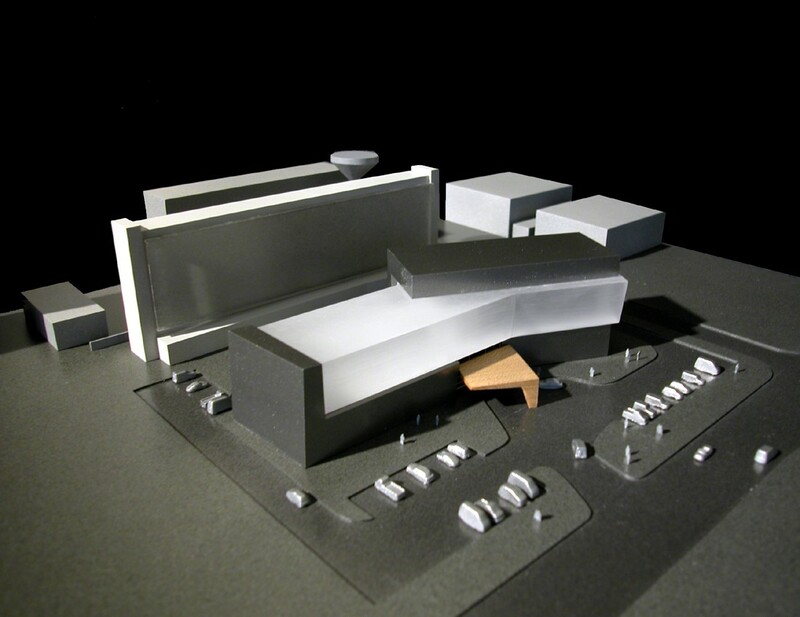 The model really demonstrates the idea of hands holding precious crystals as the main theme in the competition entry for this adventurous cosmetics firm’s headquarters. The use of cold cast aluminum poured over a mold and then burnished with warm tones transforms the metal into a very tactile surface into which are set hard edged crystalline forms of acrylic. 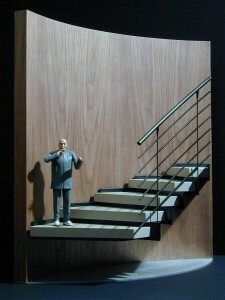 This dynamic illustrated Ron’s ideas in a very powerful way. 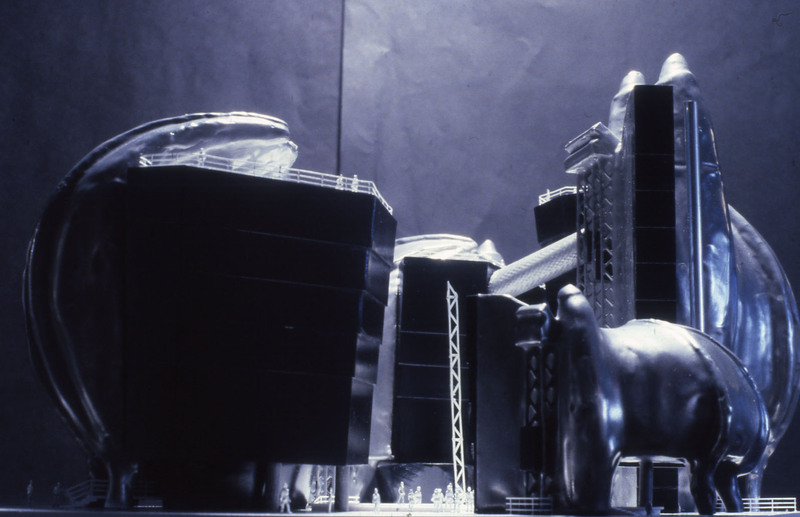 Ron’s Birthday cake linking his work with Archigram and the Walking City ideas and his penchant for marzipan Christmas cakes. 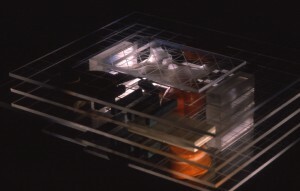 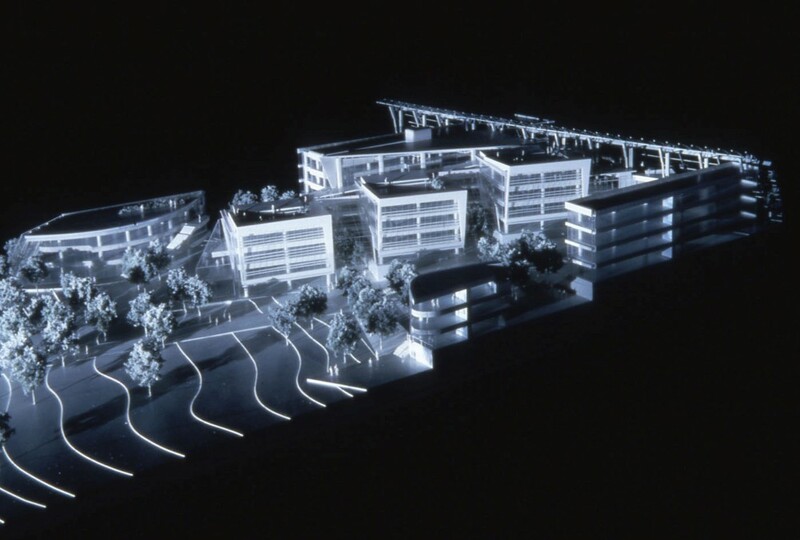 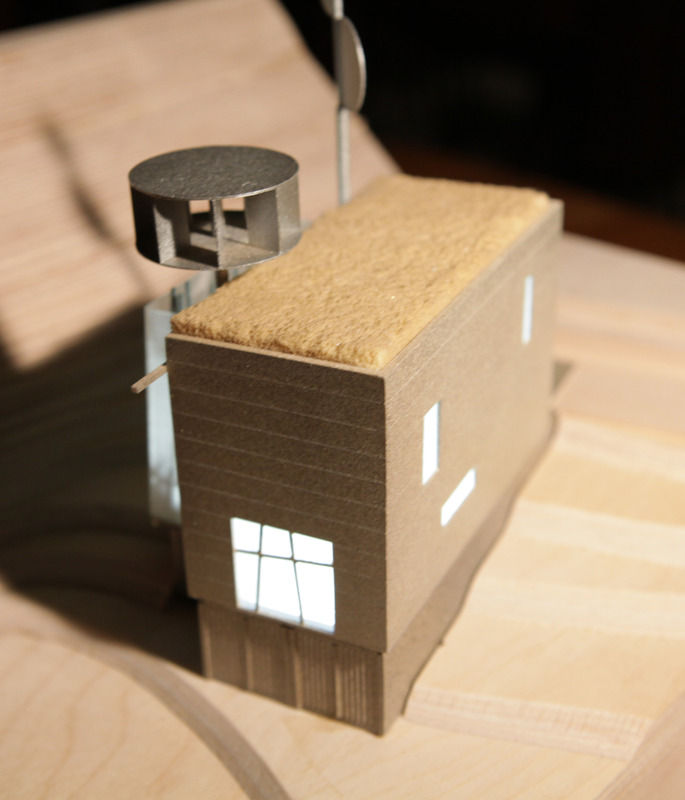 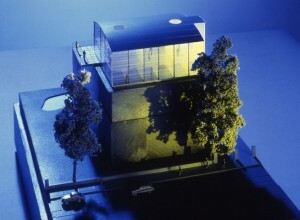 A very small (4″ tall) model of an idea for the Headquarters of this Telecommunications giant in Asia, lit by a small battery powered LED. 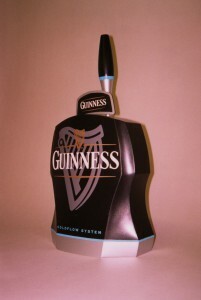 It came in its own visually impenetrable wooden box and unveiled at the boardroom table to much surprise and delight. A competition entry for a Spanish Fuel Company’s new Headquarters. 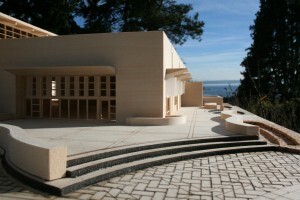 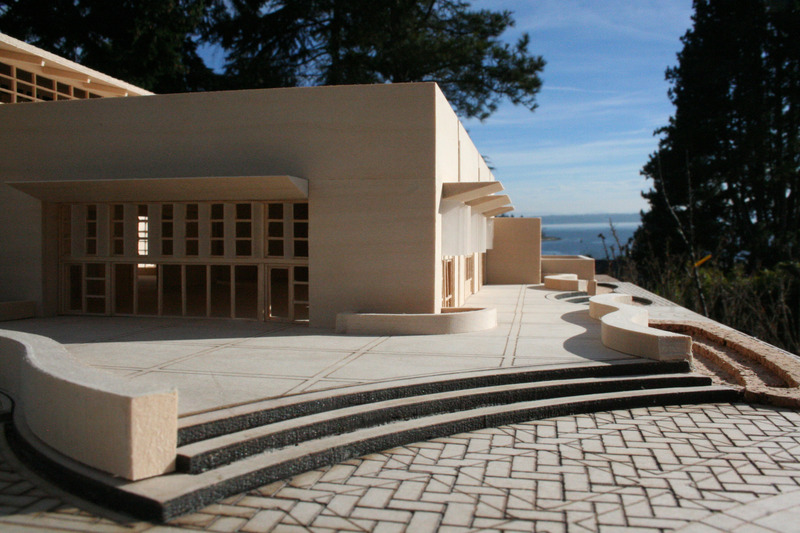 Ron proposed that the existing 60’s concrete structure be stripped and pared down to just the floors and columns. 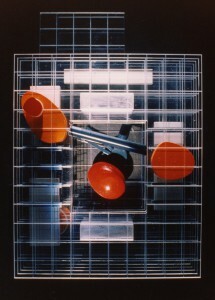 He would then inhabit that structure with a series of new program pieces inserted at various intervals. NBBJ – Reebok World Headquarters, Stoughton, Mass. 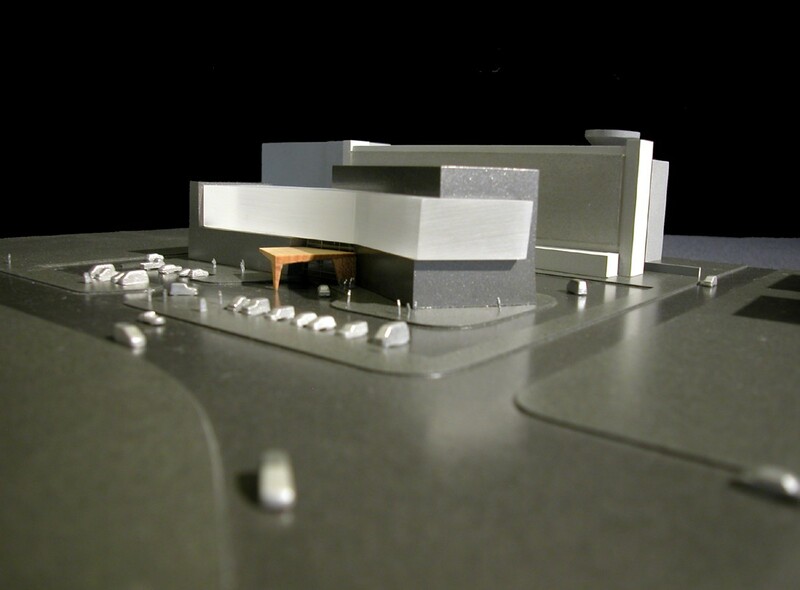 First in a series of simple models produced to guide the design intent and start to create a dialogue with the apparel designers that were going to inhabit the building. 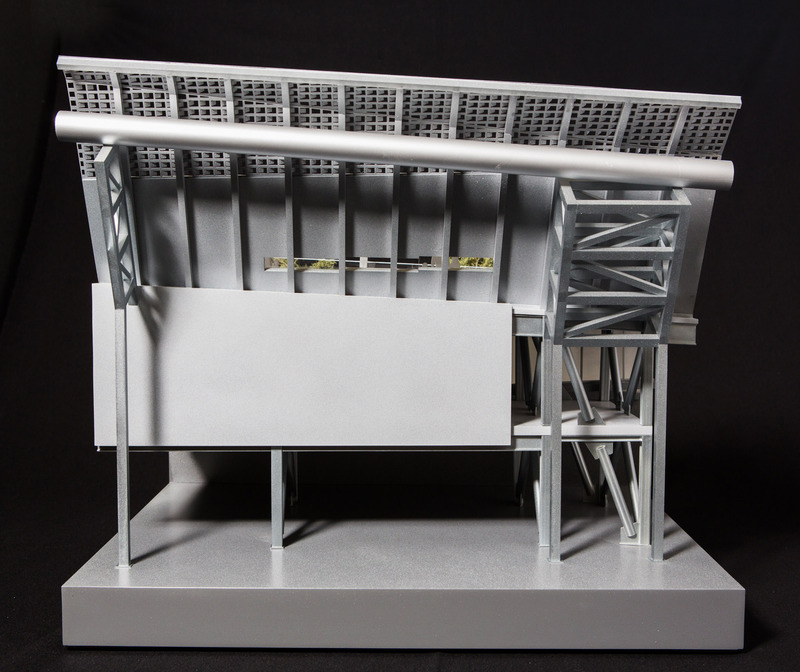 Ron designed an elegant and simple tensile structure for this bus/train interchange station for an expo in Japan. Ron wanted something really cool and punchy for the tent colour and chose this vivid pink which caused quite a stir at the client meeting. 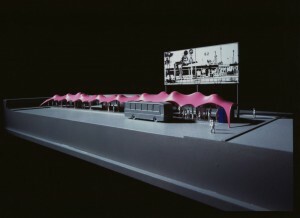 Upon being asked why the pink, he replied that it symbolized the colours of a setting sun upon a cloud. 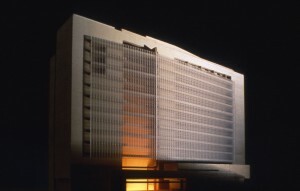 His clients loved the idea and the colour was faithfully reproduced for the tensile structure which was then up lighted so it would glow at night. 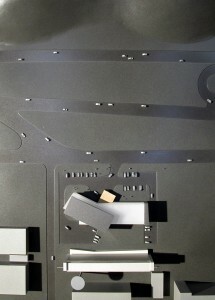 Interesting use of materials (Aluminum block and plastics) to depict ideas for an apartment in Berlin to be built on an existing concrete bunker. 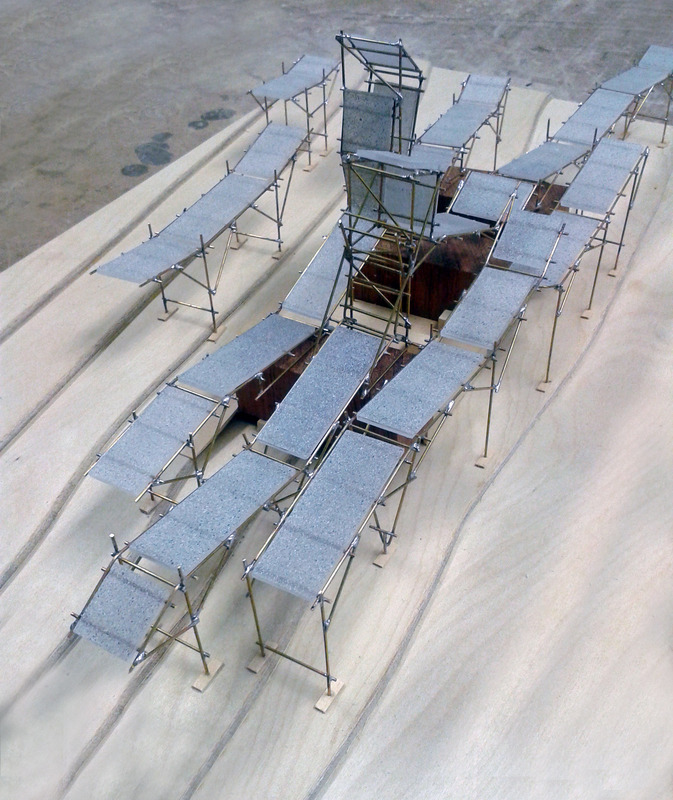 Large scale Section models large enough to put your head into to see exactly how the space would feel like of the Terminal proper and of the travel tubes leading to the planes. 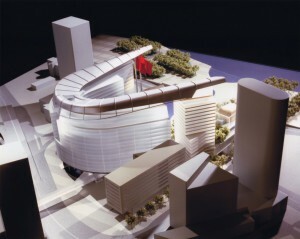 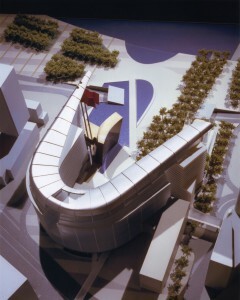 A leading competition entry for the new Chinese Government Offices in Hong Kong. 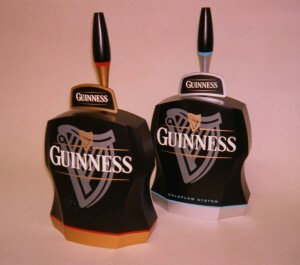 The two arms of the scheme seen embracing cultures across the seas. 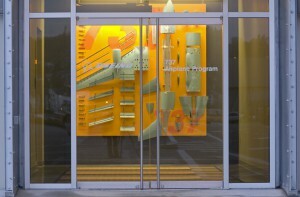 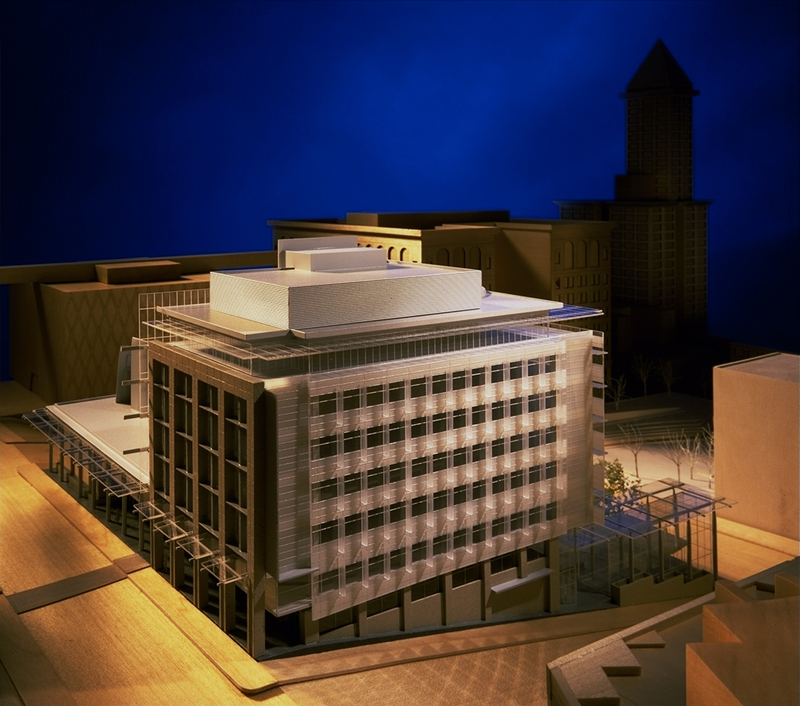 Topline Corporation’s Headquarters and design center in Seattle for the design of sports shoes and apparel. 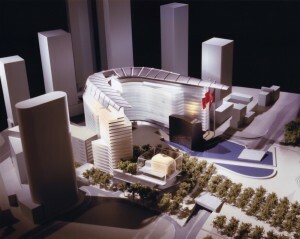 The model has removable floor inserts showing offices, design floors and storage layouts. The layering of the inserts and the way the model is painted and organized tells much about Topline’s products and way of thinking. 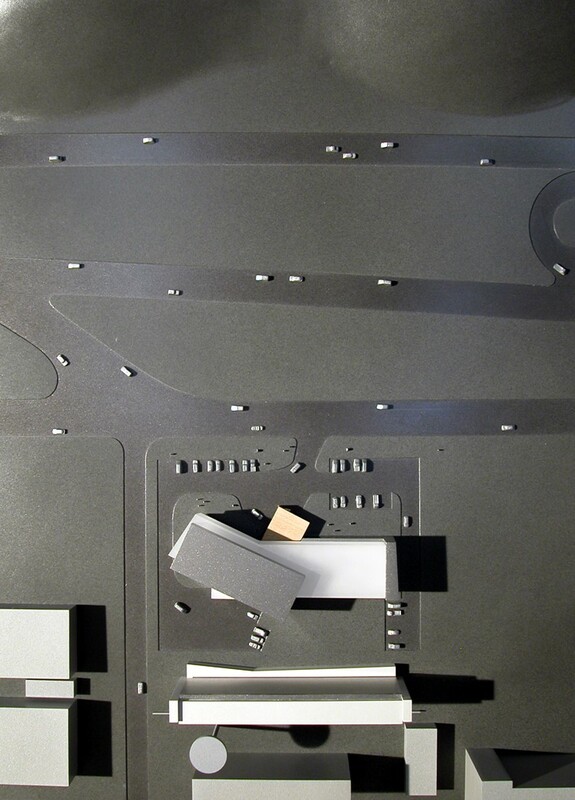 Competition entry for a headquarters building that was to house 17,000 employees and be the Telecommunications hub for Scandinavia. 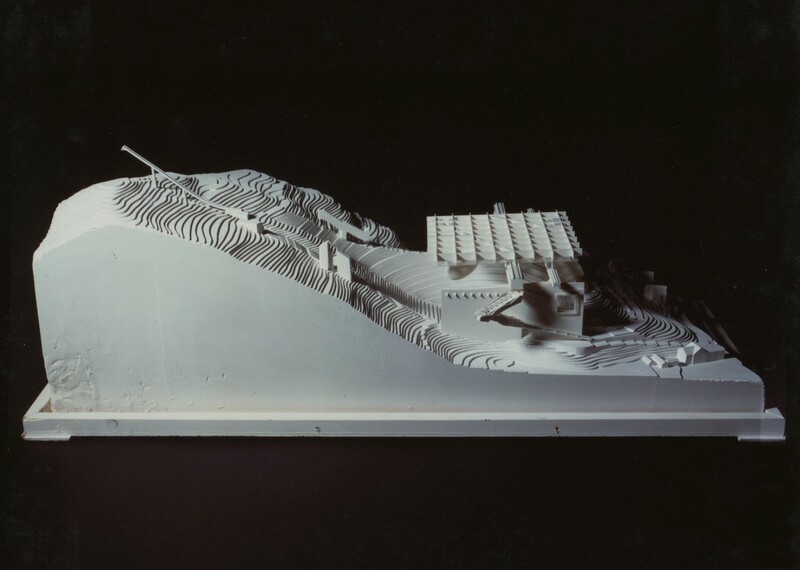 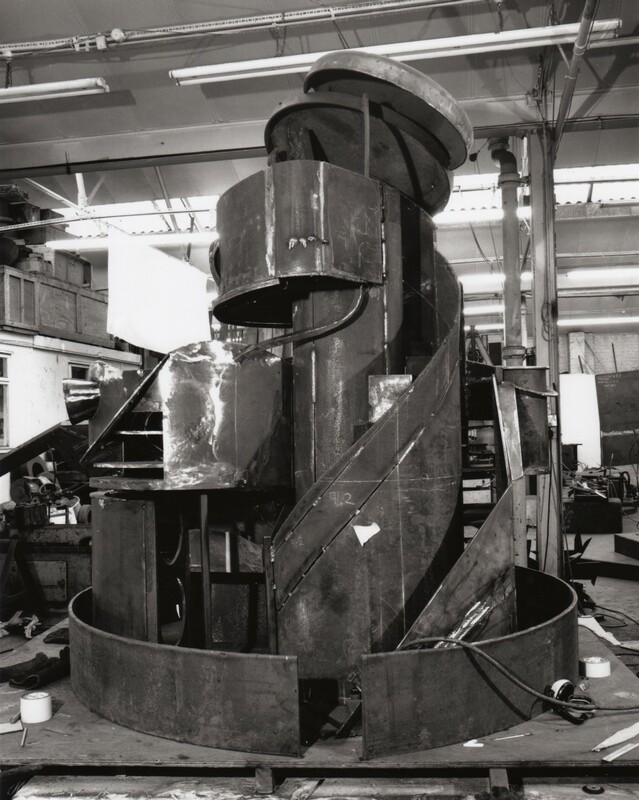 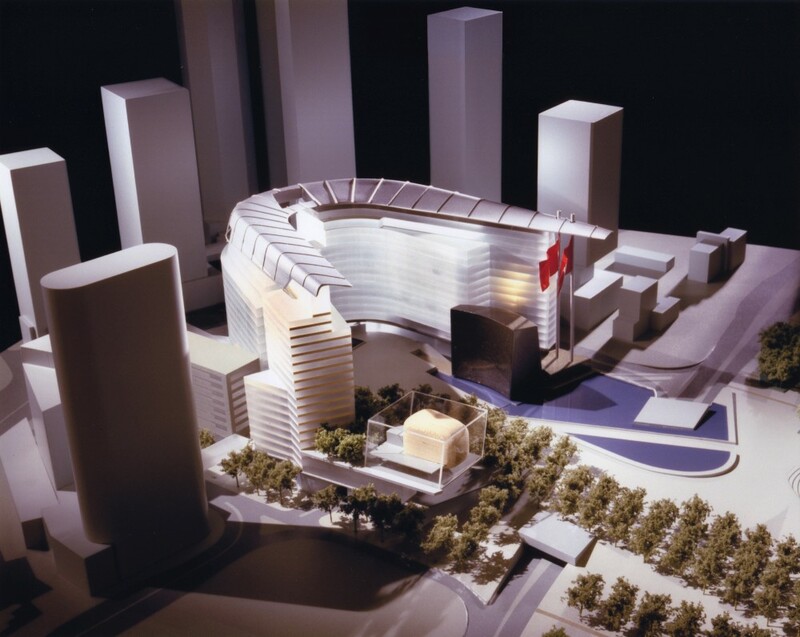 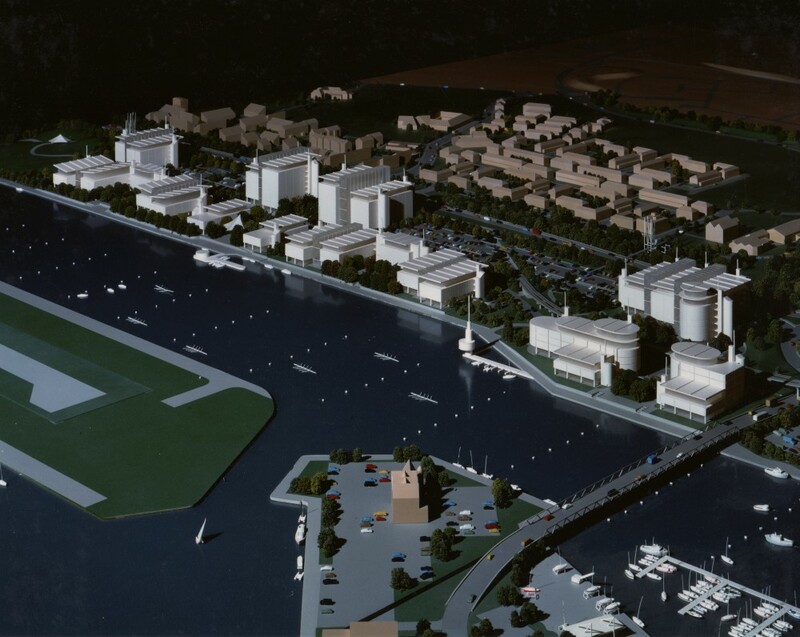 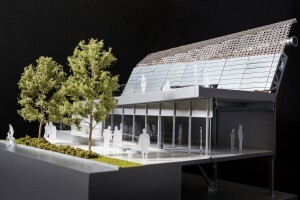 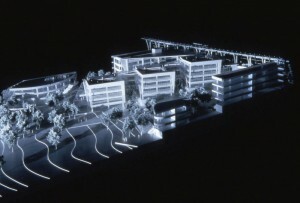 Despite the overall design being well received, it did also take the larger scale model sent with the information to demonstrate that the cutting-edge design could be built quite easily with standard construction methods to seal the deal. 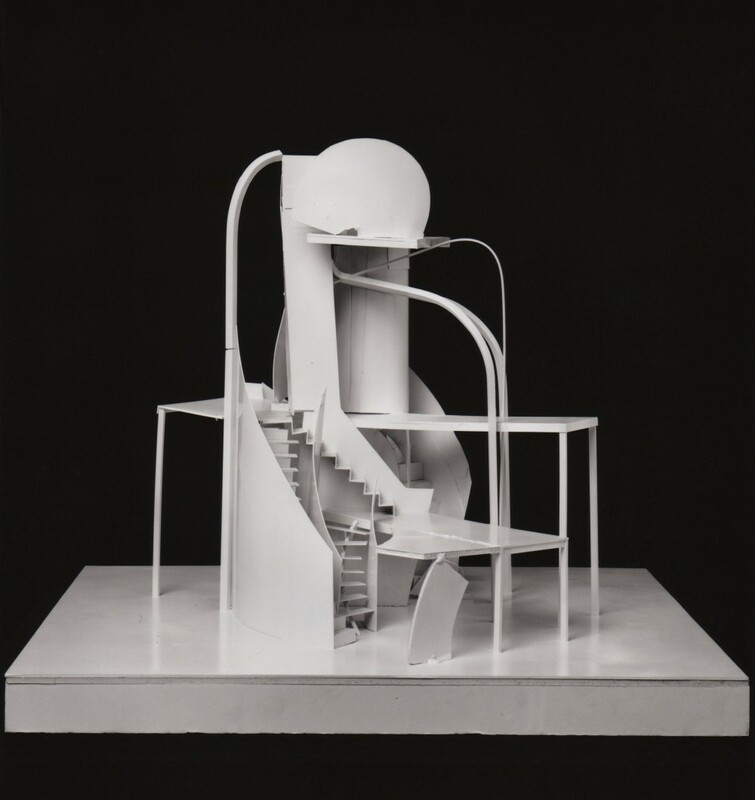 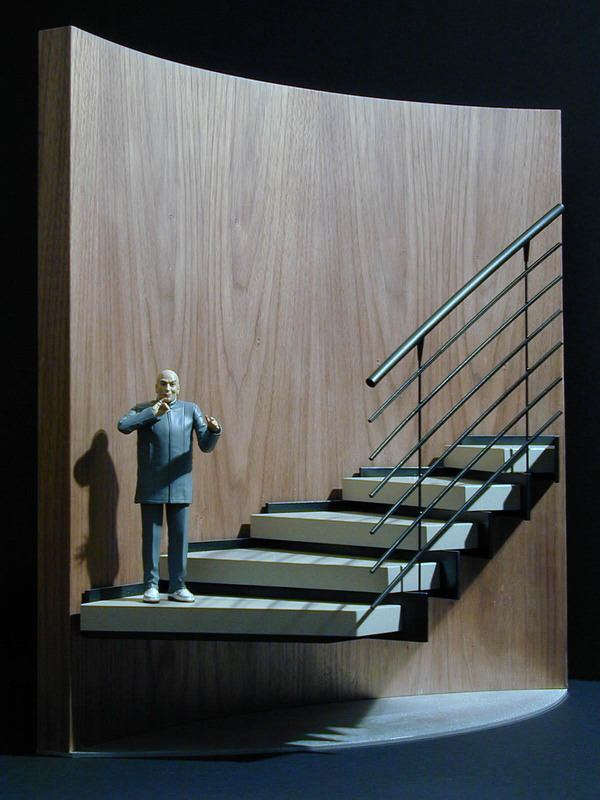 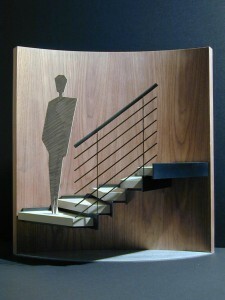 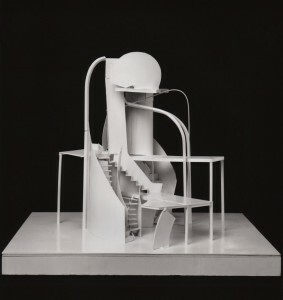 Maquette for a circular stair in a residential location. Full-size model of Guinness tap handle with super realistic paint to reflect final finishes.